Jalandhar: Certified Management Consultant to 20+ Countries & Foreign Representative of Government of Manitoba (Canada) in India, Jagat Shah reached Lovely Professional University where he guided thousands of enterprising LPU students about Prime Minister Narender Modi’s dream projects. 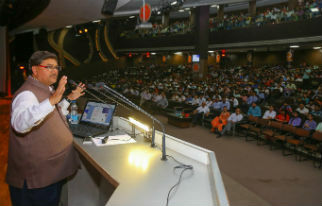 He advised LPU students to adopt ‘Make in India, Start up India, Digital India and Stand up India’ initiatives of the country, add value to the Indian Economy and rule the world. For this, he interacted with the students on the topic “Innovative Approaches to build Career in New India 3.0”. Taking illustrative examples from the top businesses’ countries- the USA and China; Shah forwarded many dos and don’ts to the students. He emphasized on the need of innovation in career by shifting towards self-employment. In fact, commonly known as ‘Mentor On road’ Shah is to soon conduct road-shows in India to share his experiences of the USA and other countries, and will connect businesses in India to the 4000+ startups he saw in the USA. “Individualize yourself by having personal website, Video CVs, Linkedin Profile, Twitter Handle; do something different to establish your identity in the world; learn more languages; awaken competitiveness within the self; have internship with industry; innovate; be productive; have a mentor from early stage of life; learn success from failings; work online; create startup to solve emerging societal problems” and many more key-liners were the pieces of advice forwarded to LPU students from mentor of mentors Jagat Shah, as great recipe of success in life. LPU students too asked many smart questions to him and promised to incarnate PM Modi’s dream projects. In fact, LPU & JMA (Jalandhar Management Association) had invited Jagat Shah at LPU campus to interact with students during open discussion hours and later with Small Medium Entrepreneurs (SMEs) of the region during ‘Industry Meet’ session. The industry meet was attended by many SME owners from the region including Atam Valves, Fine Switches, IEC Gensets, SV Industry, Opal Auto, Samar Security, HR Winning, MSME officials and office bearers of PHD Chamber, notable CA of the city Ashwani Gupta and others. Appreciating LPU study environment, Shah shared: “What makes me feel good is to see honest intention and commitment by the university management to deliver quality services to students, and in reciprocation the positive approach of LPU students.” He promised to support in setting up a food development ‘Center’ at LPU campus in promoting start up initiative. Shah also assured every possible support to ensure growth of SMEs in the state. He invited all the industry owners to join his initiative and become part of his partnership with American business owners. Prior to this all, President JMA Ahsanul Haq, LPU Director General Er H R Singla, Executive Deans Dr Sanjay Modi, Dr Lovi Raj Gupta and Director LPU Division of Industry Interface Raj Nidhi Sharma accorded warm welcome to the distinguished visitor.